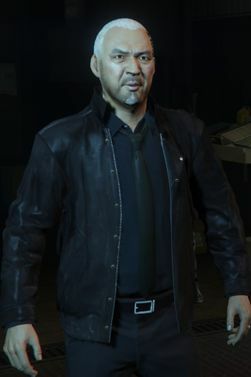 Wei Cheng (Chinese, traditional:陳伟, Wade-Giles: Cheng Wei) is a character in the HD Universe who appears as a supporting character and a secondary antagonist in Grand Theft Auto V. He is voiced by George Cheung. Wei Cheng is a businessman, Triad leader and father of Tao Cheng originally from Yangshan, China. At some point prior to 2013 he moves to Los Santos and begins a two-way trade between China and the Port of Los Santos, smuggling both drugs and guns in both directions. In 2013 he looks to expand his criminal enterprise in San Andreas and sends his son, along with a translator, to talk about working with Trevor Philips to supply them with drugs. Trevor takes them to his drug lab and escorts them to the 'storage facilities', a freezer outside the building. Upon the frost bitten translators advice Wei decides to partner with the O'Neil Brothers. Trevor then destroys the O'Neil farm leaving Cheng without a business part. He later has his men locate Trevor and they find him at his trailer in Sandy Shores, where he and Michael were in hiding after kidnapping Patricia Madrazo. Trevor, suspicious of Michael De Santa's role in a bank robbery nine years earlier, returns to North Yankton to discover the truth. Michael follows Trevor to stop him discovering Bradley Snider's corpse, which would confirm to Trevor that he had been double crossed. The Triads follow them but fail to kidnap Trevor, who escapes. They instead kidnap Michael, believing him to be Trevor's lover, with Wei phoning Trevor telling him to hand over his business in exchange for Michael. Wei's threat, however, is unanswered due to Trevor's new found hatred of Michael having discovered he had been double crossed years prior. Michael is taken to an abattoir and hung upside on a meat hook with Wei explaining the situation. Wei then leaves after telling them to kill Michael and shortly before Franklin Clinton arrives to rescue him. If the player chooses the third game ending option, Wei is killed by Franklin after leaving a beach club in Pacific Bluffs in an attempt by Franklin, Michael and Trevor to take out their enemies. Wei's son Tao can also be killed, although his death is not necessary. Wei Cheng's name, per traditional Chinese naming customs, should be Cheng Wei, with the family name appearing before the individual's first name. Cheng's surname might be Rockstar's another misspell of non-English people names, for the pronounciation of the Chinese character 陳 (seen in Grand Theft Auto V Chinese version) does not correspond with the in-game romanization Cheng, which may be the romanized rendition of 鄭 (Pinyin: Zheng, Wade-Giles: Cheng or Tcheng, tone omitted). The correct spelling should be Chen in Pinyin and Tan in Cantonese Jyutping. In this article, multiple romanizations are given due to the family comes from Guangdong Province where people speak Cantonese more often but the Triads in game speak Mandarin instead. This page was last modified on 4 March 2017, at 16:45.